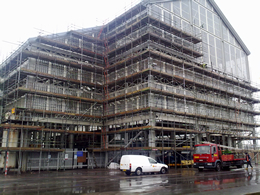 With more than 30 years of experience in the construction industry, our expert scaffolders provide the complete scaffolding service to customers across Medway. From working with design specification, through delivery, to installation at a high health and safety standard, we offer the comprehensive service. 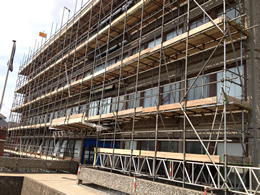 Having worked with thousands of customers on relatively small projects, and with many renowned blue chip companies, Topps Scaffolding remains one of the most experienced and respected companies in the Medway area. We were the first company in Kent to use the Layer temporary roof system. For a free, no obligation estimation on our high quality scaffolding services, call our dedicated and friendly scaffolders now on 01634 827626. For your peace of mind, all our scaffolding operatives adhere to our strict health and safety policy, which is in line with national and international legislation. We also carry £10,000,000 of public liability insurance. With our main offices and our dedicated depot located in central Chatham, we are able to hire out our expert scaffolders to projects across Kent, Essex, Sussex, Surrey and London, including Gillingham, Rainham, Rochester, Strood, Cuxton, Walderslade, Brighton, Guildford, Chelmsford, Reigate, Orpington, Canterbury, Maidstone, Stevenage, Basildon, Dartford and London. For more information on any of our products or services, or for a free, no obligation quotation, please to not hesitate to contact us.